If you’re a recent convert to Mac OS X (Tiger / Leopard / Snow Leopard / etc) or someone who uses multiple operating systems at the same time, the differences in mouse and keyword shortcuts get confusing, even irritating sometimes. One of the most irritating ones for me is the difference in what happens when you middle-click on the mouse. In Windows / Linux, middle clicking in browsers is used to open and close tabs. In OS X, this doesn’t work because middle click is used to trigger the Dashboard. Every time I would want to open or close a tab, the dashboard would show up! 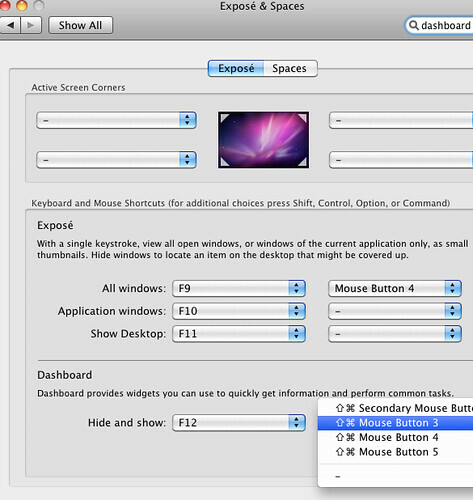 To disable this, all you have to do is go to System Preferences > Exposé & Spaces and set the mouse shortcut to “-”. And that’s it! You will now be able to middle click to open and close tabs in Mozilla Firefox and Google Chrome. For Safari, you can open tabs, but closing tabs don’t work. And there you have it, middle click tabs on Mac OS X! Make Windows look like Linux! other people that are less of an idiot that you are. Well, I've been meaning to write this entry for ages now, but I guess the procrastination glands have been working overtime lately. Frequent visitors of this weblog might have noticed the "Live From Mumbai" sign removed from the headers on the 15th of this month - that was the day I came back to Delhi, after 3 and a half long months away from home. I travelled by the new Rajdhani Express, which looks spectacularly awesome in terms of exterior train design. The interior hasn't changed much, though. I was disappointed that the notable updates to the interior were restricted to larger windows and airplane-like toilet facilities. I'm sure there was a lot more they could have done with the design. Of course, when they serve you Kaju Kishmish icecream for dessert after dinner, it's a little hard to complain about the overall experience, so I'll give it a thumbs up anyway. No, I wasn't suffering from writer's block.... it was more of a guilt sort of a thing - trying to cope up with the overdose of holidaying, and not working. Now that I'm back in my geek-workaholic-sit-in-front-of-computer-all-day mode, things should become normal soon. The first thing I want to write about is where I'm writing from. As you can see from the header graphic, I'm writing live from Mumbai, more specifically from the Informatics lab at the Computer Science department at the Indian Institute of Technology, Bombay, which is in Powai. The work environment at IITB is quite different from what I'm used to. The networks here are built like fortresses; everything is secured. It took me hours to get past the firewalls and figure out a way to check my own (outside) email. IITB(or atleast the part I've seen so far) is a linux country; windows machines are harder to find than girls on the campus. Microsoft seems to be flaunting a new attitude, one that says "Yes we're evil. Now let us try to become good". Rob Scoble is almost 100% of the time using this as his basic evangelistic premise; new language technologies ASP and .Net support unix-friendly PerlScript; and the open-source-like pre-pre-pre-alpha release of Longhorn is full of this apparently positive approach. There is news that Ramsus Lerdorf is going to speak at Linux Bangalore 2003. The event is from the 2nd to the 4th of December, and my endsems start from 8th. Why does this always happen to me?! I guess I can console myself with the fact that Zeev and Andi(the current maintainers of the language and designers of the upcoming fifth version) are not coming.